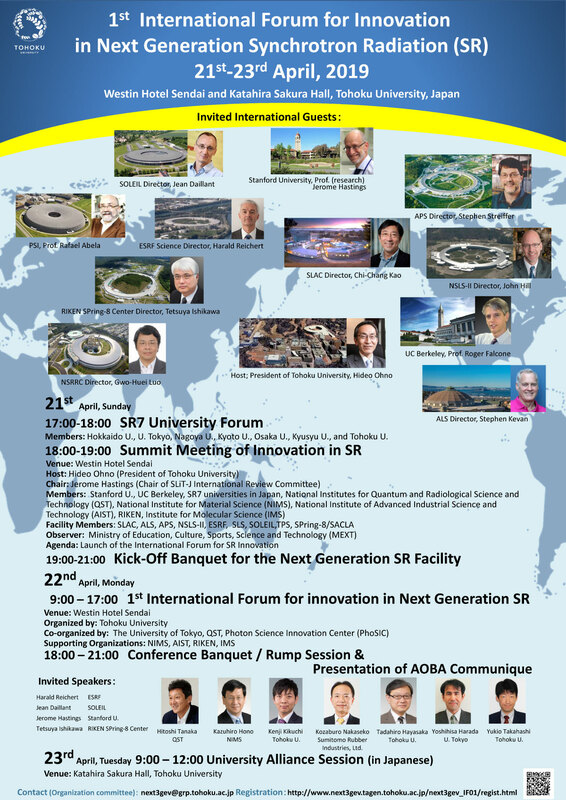 In This April, Tohoku University holds the Summit Meeting of Synchrotron Radiation Innovation, the 1st International Forum for Next Generation SR Innovation and SR7 Alliance Session from April 21st to 23rd, 2019 at the Westin Hotel Sendai and Katahira Sakura Hall, Tohoku University, in Sendai, Japan. Since 2012, we have been pursuing the low emittance 3GeV Synchrotron Radiation Facility project: SLIT-J (Synchrotron Light in Tohoku, Japan). After extended deliberations, the Japanese Ministry of Education, Culture, Sports, Science and Technology (MEXT) has just decided to initiate the new 3GeV facility construction on the campus of Tohoku University. The construction and operation will be carried out by a new organization. It is a Public – Private / Local Governments Partnership in which the partners are the QST (National Institute of Quantum Radiological Science & Technology), Tohoku University, Miyagi Prefecture, Sendai City, the Tohoku Economic Federation as well as the Photon Science Innovation Center, Funding comes from private sector investments, local governments as well as Tohoku University's support. The core strategy of our project is the construction of a research complex based on a global Industry-Academic Alliance as well as local industries. As the partner university, Tohoku University shall play the central role to usher the innovative exploitation of the facility with six main universities as well as industrial partners. This Summit Meeting and Forum will bring together top universities and national research institutes in Japan as well as leading international synchrotron research facilities. The focus of the summit and forum will be on the problems involved in collaboration between the university community and a SR facility to organize a vibrant research complex.